Get ready for the SPRING SEASON with a fun, standards based writing assignment! 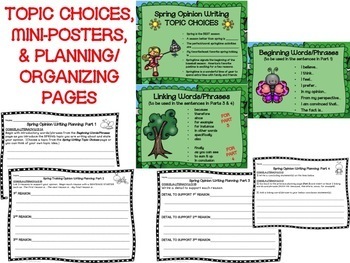 Students will use this pack to PLAN/ORGANIZE, DRAFT, REVISE, EDIT, and write a FINAL COPY of an opinion writing piece. *Students can select a topic they are interested in writing about in their piece. 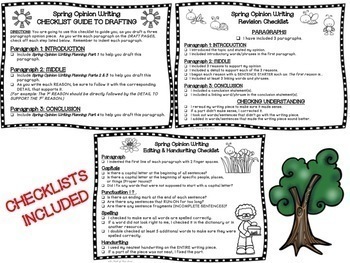 -CHECKLIST GUIDE TO DRAFTING (to help students draft their 3 paragraph opinion piece)--It is suggested that this be used along with the teacher providing more thorough guidance. 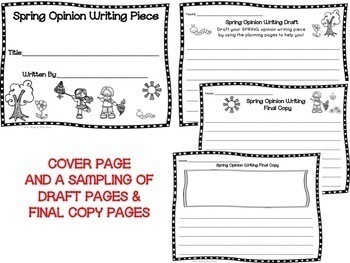 -DRAFTING PAGES (for students to write a Rough Copy) *Both numbered and "un"-numbered pages are included. -FINAL COPY PAGES (for students to write a Final Copy) *Both numbered and "un"-numbered pages are included.